Inactive subscribers are opted-in contacts with valid addresses who haven't opened or clicked your email campaigns in a while. It's helpful to identify and segment your inactive subscribers, so you can send a re-engagement campaign to win back their interest. In this article, you'll learn how to identify your inactive subscribers and save them as a segment. This article covers a task that uses segments. You may want to learn the basics of segments. Perform the steps in this article before you unsubscribe inactive contacts or send a re-engagement campaign to inactive subscribers. An inactive subscriber is an opted-in contact with a valid email address who has not opened or clicked your campaigns recently. The amount of time it takes for a subscriber to become inactive depends on your sending frequency, and the type of product or service that you promote. For example, if you use Mailchimp to market a product with a short sales cycle, an inactive subscriber might be someone who hasn't opened the last five campaigns you sent. But if you market seasonally, it might take a year or more for someone to become inactive. It's up to you to determine how long you think an inactive period is, and segment inactive subscribers based on that criteria. If those subscribers still don't open your campaigns after you send a few re-engagement campaigns, you may want to remove them to lower your Monthly Plan. There are a few ways to segment inactive subscribers in your audience. 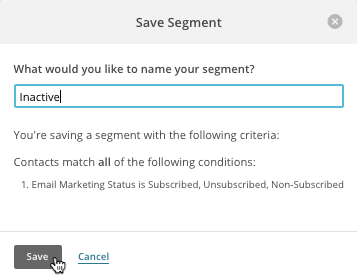 Segment by contact rating to find long-term inactive subscribers, or use campaign activity as your criteria to find people who didn't open your most recent marketing emails. When you segment by contact rating, you'll identify subscribers who have a negative rating of one star. Contact ratings do not include activity from automation, ad, or landing page campaigns, so this method is best for finding low engagement in regular emails and A/B testing campaigns. To identify inactive subscribers based on contact ratings, follow these steps. Click the Contacts match drop-down menu and choose all. For the first condition, set the drop-down menus to Email Marketing Status | is | Subscribed. For the next condition, set the drop-down menus to Contact Rating | is | one star. Review the segment, and click Save Segment. After you've created your inactive segment, you can send a re-engagement campaign. When you segment by campaign activity, you identify subscribers who received recent campaigns, but didn't engage with them. You can choose to show subscribers who didn't open or click all of the last 5 campaigns, all campaigns within the last 7 days, all campaigns within the last 1 month, all campaigns within the last 3 months, or any of the last 5 campaigns. To identify inactive subscribers based on campaign activity, follow these steps. For the next condition, set the drop-down menus depending on your preferred campaign activity criteria. Optional: To exclude new subscribers from the segment, click Add to add another condition to the segment. Set the drop-down menus to Date Added | is before | a specific date. Choose a date prior to a recent campaign to protect any new subscribers who haven't received a campaign yet. To make the most of your re-engagement strategy, use precise segmentation criteria. This might mean you'll create multiple, complex segments of inactive subscribers, rather than just one. For example, one for subscribers with both a low contact rating and recent purchase activity, and another for subscribers with both a low contact rating and no purchase activity. After you identify and segment your inactive subscribers, plan a re-engagement strategy so you can win back their interest. If subscribers don't open or click your re-engagement campaigns, you could reduce your Monthly Plan rate by unsubscribing them.